Artist Paul D’Agostino invented a ‘Chromatic Alphabet,’ a painted visual language of simple shapes and colors. 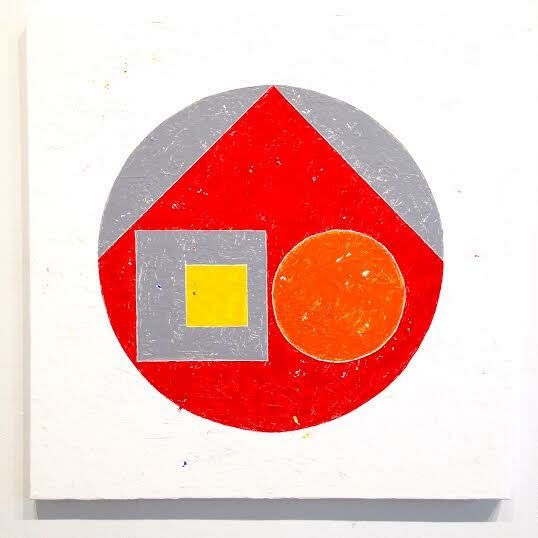 Its’ aesthetic appeal is analogous to the paired down geometry of Robert Mangold, Frank Stella, and Leo Valledor. Yet his alphabet is more than a series of aesthetically pleasing silhouettes and shades arranged atop spackled ecru canvases akin to a Robert Ryman. Absorbing in their own right due to their minimalist, meditative, and graphic aura, no shape is devoid of meaning. Each represents a letter following a mathematical logic based on a simple set of rules including vowels, consonants and other laws of language. D’Agostino maps this out in a piece called the ‘Simplified Alphabet,’ in which each shape is delineated from A to Z. Decoded, the paintings could very well be used as a valuable educational tool to help people obtain a deeper understanding of the written word. It’s no coincidence that in addition to his career as an artist, D’Agostino works as an educator in multiple languages and has been teaching for a cumulative 19 years at Parsons School of Design, New York University, and The New York Studio School. His passion radiates as he emphatically elucidates the importance of language in communication, education, and art. D’Agostino: Mostly the questions I got from people about the alphabet were if I had developed it with any intention of using it educationally. I didn’t. I did it to make paintings that featured text but didn’t appear to. There was this cryptographic idea at work but it wasn’t for any pedagogical reason. People looked at the paintings and said, ‘My kid who is dyslexic might really respond to this.’ That was the real smack my head moment when I realized it’s much more beautiful as an educational application than as art. Jeffery: Is education a recurring theme throughout your artwork? D’Agostino: A lot of my work features linguistic shifts from a purely lexical or literary application into something that can become visual art. It’s always been very seamless to incorporate language, writing and ideas about translation into my work. Jeffery: Have you had the opportunity to teach the chromatic alphabet to kids in schools? D’Agostino: I haven’t. I’ve had some primary school teachers contact me and ask if they could try using it. There are some professors in Chicago who want to incorporate it into a philosophy course. Most of the people who are interested are those who do some kind of speech therapy or who work with students with reading disabilities. Jeffery: Are kids able to decode it? D’Agostino: My friend’s son who is eight-years-old was decoding it very quickly. He went into the gallery and wanted to understand it. He wrote in the sign-in book, ‘I really like your ‘Chromatic Alphabet.’ It’s so much fun. But what you should do is add a sound element to it. They should make noise too.’ And what was cool is that he is already trying to take it one step further. Jeffery: Perhaps he is an aural learner. What kind of learner are you? D’Agostino: I’ve always been very good at studying from a book. Especially with languages. I like the written approach because I have a good memory of how words look together. Other people’s memories are completely different. When you teach the alphabet or reading there are ways to teach it in an indirect visual way. It’s like when you’re teaching math, to teach fractions you can show a pizza or a pie. Jeffery: That explains why some people dislike numbers but love geometry because it’s the more visual element of math. D’Agostino: Exactly. Math has many natural visual elements that you can bring in. You don’t have visuals when you’re teaching the alphabet. For a lot of learners that’s ok. But if there’s a problem in remembering the sequencing of things a ‘Chromatic Alphabet’ is a different way of conveying the same information. For example, a kid could be having a hard time spelling because it doesn’t make sense to him or her. But through this indirect thing that is comprised of colors and shapes he or she could be like, ‘Ok, I can visualize it like this and make its’ letter equivalent.’ So rather than having no middle step, there’s a middle step. The middle step is what we all do when we’re learning a different language. Jeffery: And learning multiple languages develops a deeper understanding of all languages. D’Agostino: That’s the key. I’ve always liked reading and writing but the more I got involved in learning other languages the more I became passionate about English and how it’s structured. The structures in English have similar structures in other languages. It’s a comparative language thing and you can never really learn everything about each one. There’s always an idiomatic expression that’s going to throw you sideways. But that thinking through something else is a really important step in learning a foreign language. If you’re getting to the point where you’re just starting to speak a new language, then you’re probably still thinking through English and that’s ok. You’ll eventually get to a point where you’re not thinking through English anymore. You think directly. Maybe that’s what the ‘Chromatic Alphabet’ step could be for certain kids. Maybe that’s the thing they think through for a little while. Jeffery: So would mathematically inclined students be more responsive to the ‘Chromatic Alphabet’ or is it more for artistic learners? D’Agostino: That’s my biggest question mark. I really don’t know. I think if nothing else, it would be fun for young learners to be exposed to it whether or not they have problems with reading or writing. They could use a tool like a coloring book and then have to refer to the cover of the book on which is the simplified ‘Chromatic Alphabet’ is decoded. Jeffery: You should make a coloring book. D’Agostino: I should. Even if they have no problem reading, they’re coloring, which all kids love to do. And they’re doing a little bit of code breaking and basic translation. There is nothing wrong with coloring a horse and a pig on a farm. They’re coloring and learning about animals, but this is just one other way for them to do some art. And their mind is going to be engaged on more levels than if they were coloring a pig on a farm because they’re learning a language. Jeffery: And people of all ages love solving mysteries and the sense of accomplishment that comes from cracking a code. D’Agostino: I keep thinking of it as eight-year-olds are going to have fun with it. But the truth is at any age you can have fun with it. With enough exposure you can simply read it. I can just read it. I mean, I’m kind of cheating because I made it up. But I still had to learn it. Jeffery: So you’re fluent in your visual language? D’Agostino: Yeah. Drawing and reading. It’s based on a color sequence. So even passively people are going to learn about color theory. They’re going to learn that between yellow and red is orange. And perhaps they won’t question it but that will become a visual reference for them and maybe one day they’ll take an art class and know instinctively that when you mix yellow and red together you get orange. Jeffery: So again it translates into the language of art and color, which brings us full circle because it’s how the paintings initially appear. Where would you ideally want to take this concept from here? D’Agostino: I’m just going to keep making paintings that have words on them. I am going to do a series of paintings with the word ‘soul’ because the soul is a weird thing. It’s this beautiful, very Ace of Bacey idea but it’s really compelling. A lot of the words for soul in different languages have many vowels. I thought that was interesting because a vowel is an open sound and a soul is this thing that can’t be seen or it’s in the air. Jeffery: It’s open to interpretation and exists without definition. D’Agostino: Yes. It would be compelling to paint a lot of really basic words that are more loaded with meaning than the average word. Jeffery: What other words would you chose to paint? D’Agostino: Another painting would be time. Jeffery: Would you ever consider taking it further than painting words? Would you ever write sentences, paragraphs or stories? D’Agostino: Definitely. It would be a huge undertaking but I’ve already thought about writing the first lines of a poem. It would be nice to do it on thick paper with gouache. Or in a coloring book that has some text in it. I’d love to have a dialogue with anybody about where to take the coloring book idea next.